Awesome! So much bang for the buck! This is placed it the stairwell going down to our lower level, and it gets a compliment any time someone passes it. Takes forever to assemble, but it is so worth it. The frame of it was bent a bit, but I didn’t notice until it was already hung, so it wasn’t worth taking it all down to exchange. This stunning 10-light Crystal Chandelier only uses the best quality material and workmanship ensuring a beautiful heirloom quality piece. 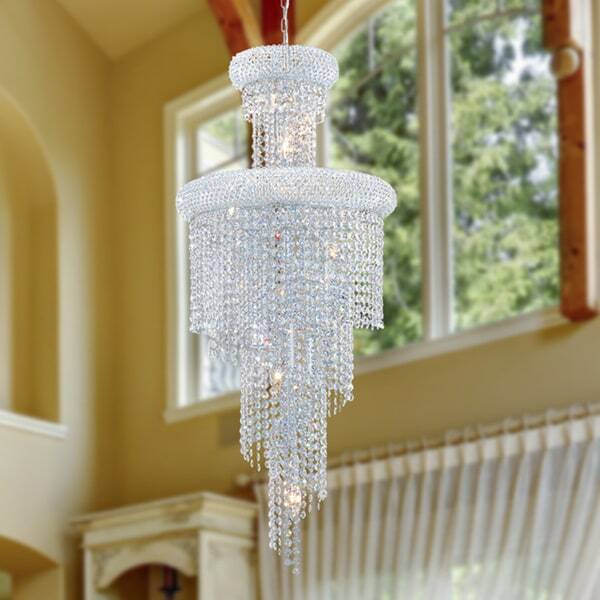 Featuring a radiant Chrome finish and finely cut premium grade crystals with a lead content of 30-percent, this elegant chandelier will give any room sparkle and glamour. Dimensions 16.0 In. X 16.0 In. X 36.0 In. Beautiful, everyone giving us so many compliments, look amazing and give a lot of lights in our living room. After shopping around for a chandelier for my front entryway, this was exactly the style I was looking for and it was priced so much better than I saw on other sites. A lot of work to put together but worth it. Very model and beautiful on my dining area. Very model and beautiful in my dining area.hard to put the lite bold on the upper area.